Give love and you will it will be returned to you! Les Fleur Sauvage is a unified society with the commitment to supply a forum for undiscovered talent. I love the way you look today. I grew up singing The Beetles and progressed into Rock & Roll. Since then, I have learn to enjoy all types of music. In 1982, in Wisconsin, at the Alpine Valley concert venue, Steve Tyler of Areosmith tossed me my first harmonica. From then, I have been tormenting ears and drawing cheers. I surrender to this wailing instrument and it�s fervor takes root in my soul. When in a grove, some say, that it�s power radiates through me. The harps� soaring song lifts me up into the cosmos. It�s like most things. If you stick to your guns, great things can happen. Please do not let any negativity keep you from living your dream to touch the stars. Read about Zongzi's abduction by the sewer people! "Zongzi's Journey"A spell binding story that introduces you to some of the main characters that are found here at Rick Sentieri's Fantasy Magazine. You'll read about: Peanuts the renegade house mouse, Charlie the passionate goldfish and Bonsai the wolf. Along with Sandy, the local witch, and Pappy, the one legged veteran, they assist Zongzi in finding his way to his ladylove, the beautiful Jane. We are looking for some help turning this paranormal love story into a big screen classic! This pic was taken at Tremper High School's... "BATTLE OF THE BANDS". The members at the time of the show were; vocalist Rick, on bass guitar Dave, on lead guitar Randy, on rhythm We-wille and on drums Rick. The show was held in Tremper High School's auditorium. The high-tempo musical included a song called Live To Die. This ditty was written by Randy Sentieri. Another song was Lonely World written by Rick Sentieri. Rick came out on stage on a children's tricycle (a big-wheel) with balloons tied to it. Then Rick kicked it across the stage that put the anxious crowd in a frenzy. They began to rush the stage! The police stopped the show in order to calm the crowd down but it just got worse! The captain of the police asked Rick to quiet them down but Rick tried but the crowd just got more excited. Then Rick almost got arrested for causing a riot! After the band to played, "Lonely World" and "Live to Die" the police saw that the crowd just wanted to hear Deuce-EX. No problems what so ever with the crowd and the show was a complete success! If you would like to see video performances of Duece-Ex please look for them on UTUBE. The music was a cross between AC'/DC, Slayer and King Diamond. When the crowd rushed the stage one person lost their virginity. 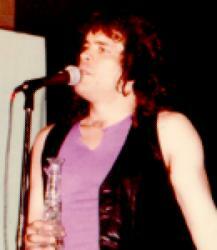 Rick performance resembled that of Bon Scott of AC/DC. Not only is Rick one of the most read poets he also my friend! "I will be updating this page every now and then, so COME BACK and learn more about Rick!"